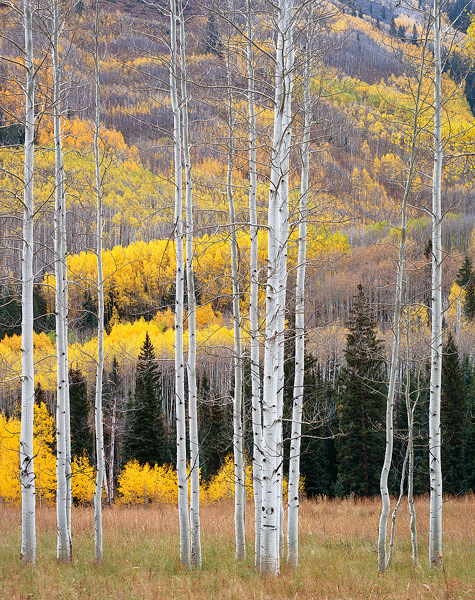 Aspen trees are one of my favorite subjects to photograph. Their trunks seem to glow in overcast light. Autumn aspen leaves turn spectacular shades of gold, red, or orange. Colorado hillsides like this one consist of many different aspen stands, each with its own color and schedule for dropping its leaves. This image from the Maroon Bells-Snowmass Wilderness area depicts the graphic beauty of a Colorado aspen forest in early October.